As one of the “BRIC” countries, Russia enjoys special attention from investors seeking rewards in its projected growth alongside Brazil, India and China. Yet Russia’s unique demographics–deeply divided along age, geopolitical and even professional lines–render a “one size fits all” localization approach unlikely to succeed. Success in Russia depends on properly localized products and services that speak the language of your target customers. 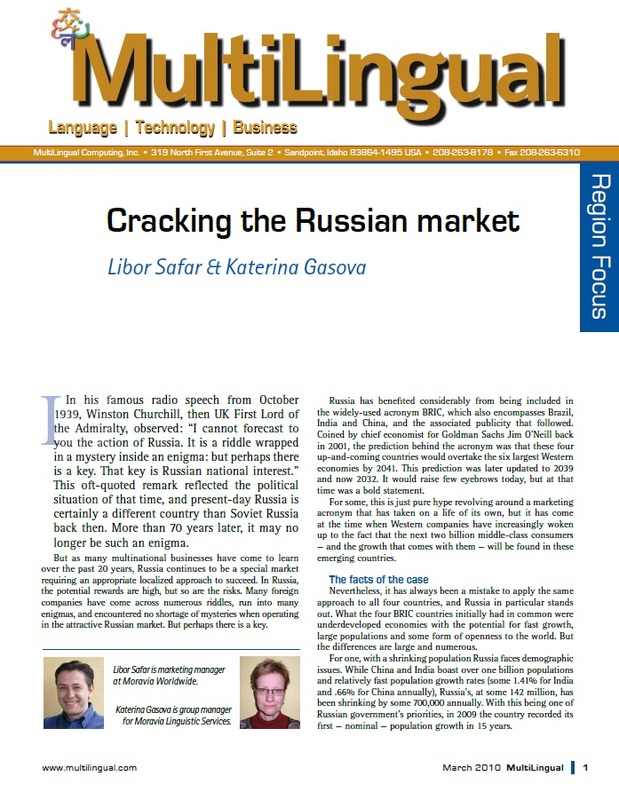 Russian has been constantly rising in importance as a target language for most global companies. In fact, for some, Russian has become their "tier-one language", on par with say German or Japanese, signifying the importance of the correct Russian localization. From language structure and skepticism about partnerships to consumer spending habits and varying degrees of trust in local vs. international brands, the Russian market offers both goldmines and landmines for global trade. Achieving ROI depends heavily on your ability to navigate based on the specific needs of your target audience.